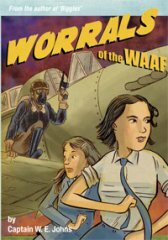 The adventures of flying officer Joan 'Worrals' Worralson, a female pilot in 1940, and her sidekick 'Frecks'. Joan was not allowed to fly alongside her male colleagues until a mysterious plane plunges her into aerial combat. Why has the author of the Worrals books been altered? They were written by W. E. Johns, not Matt Kindt? Why do you say the book is by Matt Kindt? It was written by WE Johns. As far as I'm aware, Kindt only did the illustrations. A fast moving and enjoyable story. Worrals is determined to fly and does in this book, written by an author who was himself a flyer in war-time.